Bibliomancer Comments: Supermind is a very stable genius. The F.B.I. will never outsmart him. You could say that about ruff-ly any novel. If he was in a world that DID exist, this would be non-fiction. Well of course it didn’t exist – Trump said so. Needs more eye-gouging neon pink. The man in a Spanish ruff is the clue: it’s about how we were fooled into thinking America was real. The lady has body image issues. This is concept art for Katie Perry’s halftime show a few years back. Ego, The Living Easter Egg. Let’s start the conga line! Why am I reminded of bowling? Mind blowing mind bowling. It seems that many covers from this time use the flag-on-a-pole format. I fail to see the appeal. 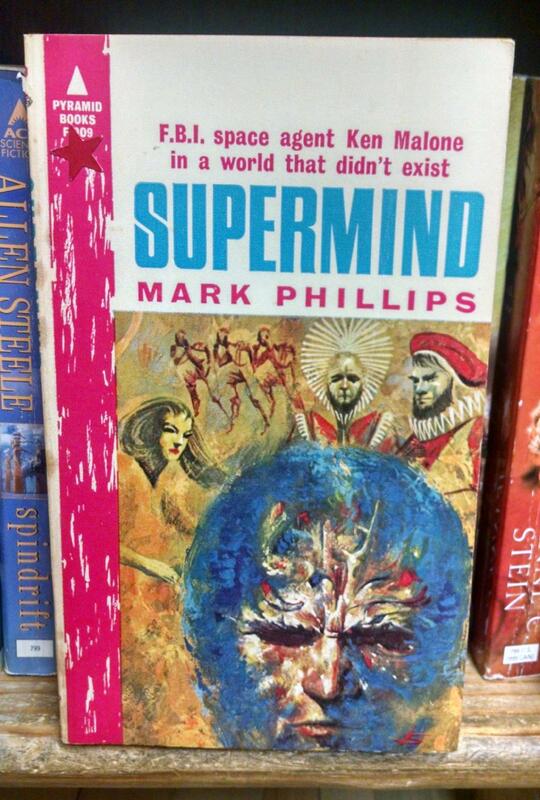 The people in Elizabethan clothing and the cat-lady appear concerned by the blue guy’s potential destructive power, presuming he is the “Supermind” of the title. Which begs the question: why did they let him loose? Blue balls are something I super mind. Is this why Princess Anne divorced him? Ugh. Colors are terrible and it’s all… splorchy. I’m guessing by the background, it’ll have some “fun” ethnic stereotypes and sexism. And I don’t know what’s happening with the headgear of the man next to Elizabethan ruff guy. NIZE HAT! @ARY (11): It’s a modular blurb. @Tat: Heh. Crossed my mind too. On the other hand, does that include Canada and Mexico too? I’d hate to think maple syrup and tacos are fake. I’d buy this book just to see what that chorus line of male dancers in the upper left corner has to do with it. They’re either doing Rockette kicks or imitating Egyptian hieroglyphic paintings. @Tracy: not sure if they’re holding a fist to their chins in a “Rodin’s The Thinker” pose, which would fit with the Supermind theme, or just sucking their thumbs. @Tracy & Bruce A Munro: It’s a formation dancing team doing a mass Bruce Forsythe impersonation.